Vodafone MVNO Crazy John's will finally shut down mobile services on September 30, with less than 100,000 users still remaining on the network. Crazy John's will be contacting the remaining customers during the course of July to inform them of the deactivation process. Some customers will be transferred to Vodafone on replicated matching plans, and these customers will be required to activate new Vodafone SIMs before the end of September. However Vodafone has also warned that not all Crazy John's plans will be replicated by the telco, and to contact either Vodafone or Crazy John's to see what your options are. Of course, customers can also choose to move to another network entirely - you won't be charged any cancellation fees and you can keep your Crazy John's handset. 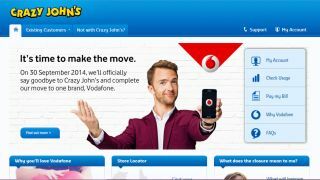 Last year, Crazy John's stopped signing on new customers and ended its prepaid services as Vodafone announced it would be retiring the brand. With services to be deactivated on September 30, the telco is warning users to move onto Vodafone or another network soon. "Customers will not be able to make and receive phone calls, send and receive SMS, or use data services from 12:01am on 1st October 2014," Vodafone said. Users will still be able to port their numbers for a "very limited time" after September 30 if they haven't already done so, but if you miss this window, you will lose your number.